So, is your mural going to fit the entire wall from side-to-side? No? Then are you going to centre it in the room? Most people do it this way. Oh, and is your wall mural going to be taller or shorter than the height of your walls? Remember, measure twice, hang once. Please, please, please…I’m begging you…measure twice, hang once! FOR THE WIDTH OF THE WALL: you’ll probably need some help from your spouse or friend to measure the width so the measuring tape doesn’t reel back and whack you in the face (coming from experience). Measure the width of your wall and compare it to the width of your MU-SKU wall mural. IS THE PAPER NARROWER? Centre it! For wall murals narrower than your wall, you can centre it and either leave wall space around it or frame it with wood trim. TIP: once you place your MU-SKU mural in water, it will stretch 1/4″ per panel. Just count the total number of panels in your package and multiply it by 1/4″ to add the extra inches to your overall measurements. Worst case scenario? You’re off by a couple inches – probably not visible to the average eye – but something to be aware of. (This is probably why I almost flunked math). Measure where you’d like the left edge of the mural to start and then make a mark on the wall in pencil. Using a level, draw a vertical line from the top of the wall to the bottom. IS THE PAPER WIDER? Trim it! If your wallpaper mural is wider than your wall, trim it (on the left, right or both edges). Measure: using a ruler against the outside edge of the wallpaper panel you’re going to trim, make several light marks with pencil at the same measurement vertically down the wallpaper panel.For example, if you’re trimming a total of 5” off, measure 4” from the outside edge and make light marks vertically down the wallpaper panel (look like a pro and leave 1” to trim later, after the wallpaper has been hung).Doing this on a hardwood floor usually works best. You can run out of room on a table. You could tear a hole if you’re on tile (where the grout is). Put all dogs, cats and babies in cages while doing this. Just kidding. But it’s a good idea to keep them occupied with something else so they don’t run all over your wallpaper. Connect the pencil marks vertically with a pencil and ruler until you have a straight, level, vertical line from the top of the panel to the bottom. Rough cut: Using sharp scissors, cut along the pencil line making sure you trim the pencil marks away on the wallpaper. Trim cut: Hang the cut wallpaper panel on the wall (after reading Step 3 following this post), leaving the extra 1” that needs to be trimmed against the adjoining wall. Once it’s up, check that the panel is level vertically and then put the taping knife against the edge that needs to be trimmed. Using a sharp exacto knife, trim the extra 1” piece off. Repeat these instructions if you’re also trimming a second panel i.e. if you’re trimming the first and last panels. FOR THE HEIGHT OF THE WALL: Most MU-SKU wall murals are 8′ or 9′ high. Ideally, your mural will be 3″ taller (or more) than your wall, since walls are never totally level and could be taller or shorter in some places. IS THE PAPER SHORTER? Centre it! If your MU-SKU wallpaper mural is shorter than your wall height, just cut the white edges off the top and bottom of each panel before hanging and then centre it on the wall. You might want to measure and draw a horizontal line in pencil where the top of the mural should line up and another horizontal line at the bottom of the wall. IS THE PAPER LONGER? Trim it! If your MU-SKU mural is longer than the height of your wall, you’ll need to trim it. This is done once it’s up on the wall with an exacto knife (not with scissors before it’s hung). Most walls aren’t completely level, so it’s best to trim some from the bottom and some from the top.For example, if you have 3” of extra height in your wallpaper, trim 1.5” from the top and 1.5” from the bottom.If you try to cut all 3″ off the top (or bottom) you might run into a section of wall that is longer and end up with an ugly gap. Remember, no wall is completely level. Ever. I promise.Just make sure you have extra at the top AND bottom to trim and use the ceiling and baseboard as a guide with your exacto knife. Hang the cut wallpaper panel on the wall (after reading Step 3 following this post) with a bit of extra length sticking to the ceiling and a bit to the baseboard. Once you’ve made sure it’s vertically level…just place your taping knife in the edge between the ceiling and wall (or baseboard and wall) and use your exacto knife to trim the excess off the bottom and top. Voila! Hanging wall murals not your cup of tea? Gimme a shout. 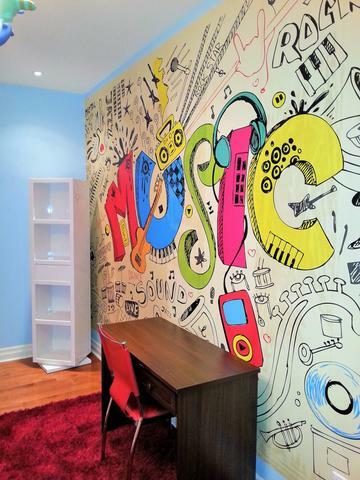 I hang wall murals from Toronto to Niagara Falls, and everywhere in between. If you don’t live around here, get in touch. I might be able to refer you to someone. So, did you get your measurements right? 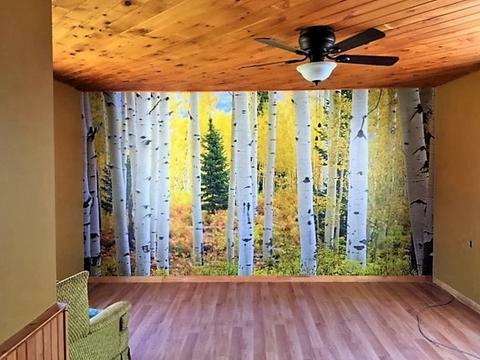 I would love to hear about what wall mural you’re installing and I’m sure my readers would love any tips you might have uncovered during the process. Fill us in in the comments below!